Russia’s state-controlled oil giant Rosneft and its partners on Saturday took over India’s second biggest private oil firm Essar Oil in an all-cash deal valued at about $13 billion (Rs 88,000 crore). Rosneft bought a 49 per cent stake in Essar Oil’s refinery port and petrol pumps, while Netherlands-based Trafigura Group Pte, one of the world’s biggest commodity trading companies, and Russian investment fund United Capital Partners split another 49 per cent equity equally. The deal has an enterprise value of close to $13 billion, which includes Essar Oil’s debt of $4.5 billion (Rs 30,000 crore) and about $2 billion (Rs13,342 crore) debt with the port company and power plant. Also, the near $3 billion dues to Iran for past oil purchases will continue to be on Essar Oil books. “The first sale and purchase agreement envisages the sale of 49 per cent to Petrol Complex Pte Ltd (a subsidiary of PJSC Rosneft Oil Company); the second envisages the sale of the remaining 49 per cent to Kesani Enterprises Company Limited (owned by a consortium led by Trafigura and United Capital Partners) at an enterprise valuation of Rs 72,800 crore ($10.9 billion). The deal would help the Essar Group, one of India’s largest and most indebted conglomerates, trim its about Rs 88,000 crore (over $13 billion) debt and ward off creditor pressure. The deal was announced as Indian Prime Minister Narendra Modi met Russian President Vladimir Putin during a meeting of the leaders of the BRICS countries in Goa. The deal is the single largest foreign investment in the Indian refining sector and will strengthen the ties between the world’s largest oil producer and the world’s fastest growing fuel consumer. The acquisition is the biggest foreign acquisition ever in India and Russia’s largest outbound deal. The all cash deal is expected to close in first quarter of 2017. “The all-cash deal encompasses Essar Oil’s 20 million tonne refinery in Gujarat and its pan-India retail outlets,” said Prashant Ruia, Director, Essar Group. “The closing of the transaction is conditional upon receiving requisite regulatory approvals and other customary conditions. We expect to obtain the relevant approvals before the end of this year,” he said. 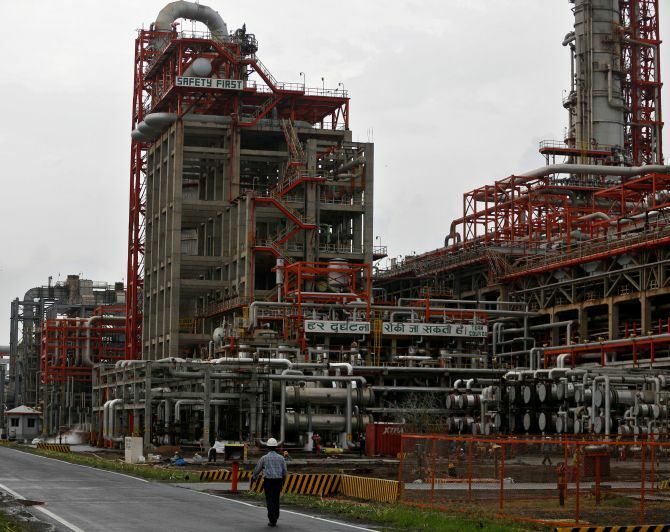 Ruia further said the 20 million tonne oil refinery in Vadinar accounts for 9 per cent of India’s total refining output and is supported by a 1,010 MW captive power plant. “The additional Rs 13,300 crore that the new stakeholders have agreed to pay is for the 58 million tonne deep draft port in Vadinar that helps in importing crude and exporting finished products,” he said. The deal includes the refinery as well as the Vadinar port and more than 2,700 retail gas stations. The initial transaction will not include a power plant serving the refinery, which could be transferred later after getting necessary approvals. Initially, Ruias wanted to shed only 49 per cent in favour of Rosneft but the $3.2 billion they would have got from the Russian company wasn’t enough to pay off the $4.5 billion debt on the company’s books. A larger 74 per cent stake was offered to Rosneft but that idea was dropped as the Russian company faces US sanctions and by a virtue of its majority stake Essar Oil too would have come on that list. At this stage, Trafigura was roped in and offered 24 per cent stake. Trafigura, which has close ties to Rosneft, was to finance its acquisition by taking loan from Russia’s VTB Capital, part of state-controlled bank VTB. Sources said Trafigura is likely to take 24.5 per cent stake and UCP a matching interest. The deal includes the Vadinar refinery as well as the Vadinar port and more than 2,700 petrol pumps. A power plant serving the refinery as well as company’s coal-bed methane blocks are not included in the deal. As part of the deal, Rosneft-Trafigura will also take over the debt of Essar Oil and the port and terminal company. Last year, US Treasury’s Office of Foreign Assets Control had issued a Crimea Sanctions Advisory, adding Rosneft and its subsidiaries to its Sectoral Sanctions Identifications List in retaliation for the Russian’s invasion of eastern Ukraine.